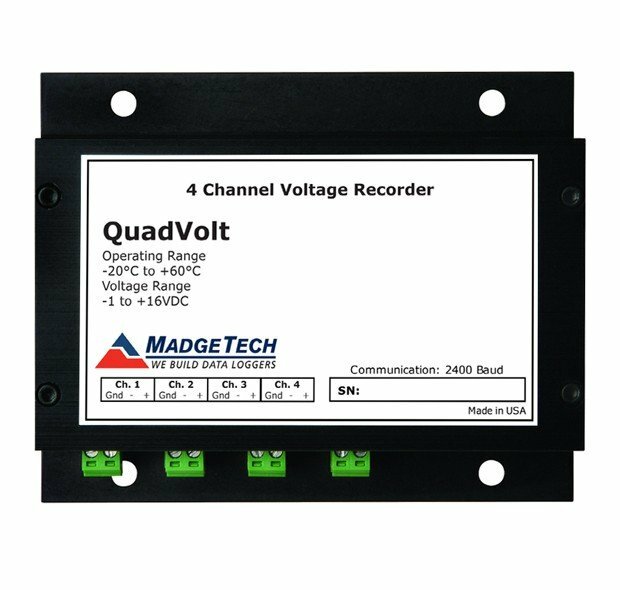 The battery-powered, four-channel QuadVolt is a standalone, all-in-one voltage data logger. This device will record data for up to 16,383 voltage measurements per channel. The non-volatile solid state memory ensures maximum data security even if the battery becomes discharged. Our Windows-based software makes it easy for users to collect, view, analyze and share valuable data. The QuadVolt works by accepting signals from sensors, transducers, and many other common voltage sources. Users will be able to program their Engineering Units as well as choose their offset and gain calibrations. For example, a flow rate sensor with a voltage output can be displayed as flow rate in the software graph and data. The device can be started and stopped directly from your computer, and its small size allows it to fit almost anywhere. 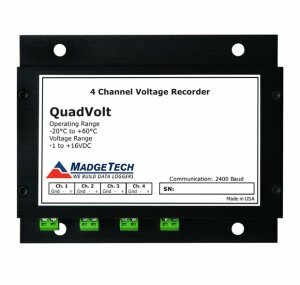 The QuadVolt makes data retrieval quick and easy. Simply plug it into an empty COM or USB port and our user-friendly software does the rest. Four different voltage ranges are available: 2.5V, 15V, 30V, and ±100mV. The ±100mV model features differential input capability.